Pope Benedict XVI, 85, officially steps down on Feb. 28. Following his abdication, experts and representatives of the Catholic and Orthodox clergy anticipate closer relations between the two churches under the next incumbent. The abdication of Pope Benedict XVI (Joseph Ratzinger) came as a surprise to the entire Christian world, including representatives of the Russian Orthodox Church (ROC). Noting the tremendous progress made between the different Christian traditions under his papacy, experts believe that, whoever is elected to lead the Catholic Church, relations with the ROC will not suffer. The official position of the ROC was stated by the chairman of the Department for External Church Relations (DECR) of the Moscow Patriarchate, Metropolitan Hilarion of Volokalamsk. He suggested that, in the face of serious challenges requiring new stimuli, the pope is naturally giving way to a younger and more dynamic successor. "Pope Benedict XVI's decision to resign can be regarded as an act of personal courage and humility," read the statement issued by the head of the DECR. "The Orthodox Church is grateful to the outgoing pontiff for his understanding of the obstacles that lie in the way of fully normalized relations between the Orthodox and Catholic churches, especially in western Ukraine." 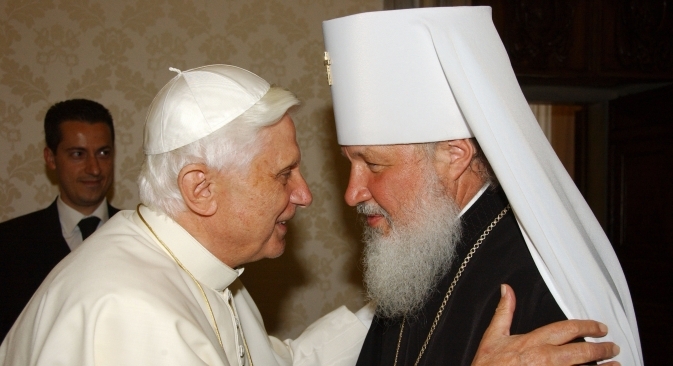 On the eve of the announcement of the pope's abdication, Metropolitan Hilarion aptly noted the positive trend in relations between the Russian Orthodox and Roman Catholic churches that had taken place following the ascension of Ratzinger to the Holy See. "It is hoped that his successor will continue along the same path, so that the relationship between Orthodox and Catholic Christians further develops for the common good of all Christendom," said the metropolitan. Patriarch Kirill of Moscow and All Russia also praised the pope's action. In his opinion, "Pope Benedict XVI's position on the most pressing issues of our time is worthy of respect, as is his steadfast upholding of the apostolic tradition." This statement was erroneously reported in the press as a comment on the pope's abdication, when, in fact, the patriarch had made the assessment a few days earlier. "The Catholic Church has always seen its most important task in deepening the ecclesiastical communion and ecumenical dialogue. Unity is achievable, but it is difficult to predict when it will happen: are we talking about the near future or centuries hence? The election of a new pope will not alter that perspective," says the Rev. Kirill Gorbunov, director of the information service of the Roman Catholic Archdiocese of the Mother of God in Moscow. Of course, the identity of the new pope will be of significance. Gorbunov admits that the new pontiff may not be European and, therefore, may be less knowledgeable about Russia than popes John Paul II or Benedict XVI. "But the basic principle of reciprocity has been formulated, and no major changes are to be expected. History and divine purpose are far greater than individual personalities. Today, the two churches are facing new challenges — in many countries, Christianity is now a minority religion. And the development of relations between Catholics and Orthodox is an internal requirement for all," said Gorbunov. Senior Archdeacon Andrei Kuraev, an Orthodox publisher, believes that predictions are futile until the successor is known. "If the pope comes from Latin America or Africa, he will have his own agenda and priorities," said the ROC representative. Roman Silantyev, head of the Geography of Religions Center, believes that, if the new pope is European, relations between the Vatican and the Moscow Patriarchate will not change. In global terms, the ROC and the Catholic Church are allies, despite some unresolved issues, such as the Uniate Church in Ukraine. "Benedict XVI leaves office with relations between the two churches in a healthy condition. Russia hopes that his successor will preserve them. That is likely to be the case if the new pope is European. If he is from Latin America or Africa, the pendulum could swing. But Catholics would prefer to see a European pope, since Europe is where the Church's main problems are currently focused," said Silantyev. Executive secretary of the Russian Catholic Encyclopedia, Alexei Yudin, agrees that relations under Pope Benedict XVI have stabilized; he believes that Ratzinger himself was of interest to the Orthodox world as a distinguished theologian. Both churches face global issues, which is leading to rapprochement rather than division. The ROC is expanding its missionary work, in which it will require pastoral assistance. "It is important to remember that the Christian East — including Russian Orthodoxy — is close to the heart of many Europeans," said Yudin. "But whoever is elected to the Holy See will have to change. It is possible that an ‘unexpected’ pontiff (i.e., African or Latin American) would display hitherto unseen energy, adding new impetus to the dialogue. In any case, the prospects for further development of relations are good."